Senior Ariel Jones of New Roads, Louisiana, is the first recipient of the new Dr. Saundra Yancy McGuire Outstanding Supplemental Instruction Leader Award in the LSU Center for Academic Success. Supplemental Instruction is an academic support program that uses peer-assisted study sessions. This free service is offered by the center and LSU’s colleges. The purpose of SI is to increase retention and graduation rates and improve student grades and academic performance within targeted, historically difficult courses. McGuire retired from LSU last summer after serving the university for 14 years. For 10 of those years, she was director of the Center for Academic Success, a unit that received national and international acclaim during her tenure and continues to garner accolades and awards. The generosity of her colleagues and friends through gifts to the LSU Foundation enabled the center to establish the award last year. 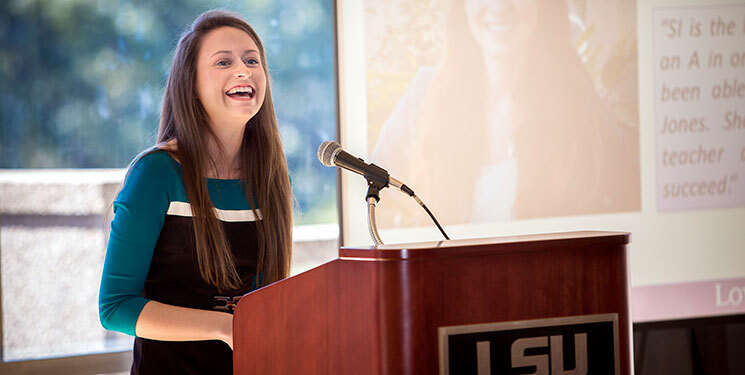 It honors McGuire’s accomplishments and the impact she has had on the center, LSU students and the campus community. Jones will graduate next May with degrees in biochemistry and Spanish. In addition to serving as an SI leader in organic chemistry for two years, she is part of the Honors College and is an LA-STEM Research Scholar. Jones was selected to receive the award for having characteristics displayed by McGuire: leadership, service, scholarship and a love of learning and teaching. In her role as an SI instructor, Jones facilitates regularly scheduled, informal review sessions in which students compare notes, predict test items, develop organizational tools, and discuss readings. Students learn how to integrate course content and study skills while working together. Jones and her fellow instructors have all previously done well in the courses for which they lead sessions, and they attend all class lectures, take notes and act as model students.